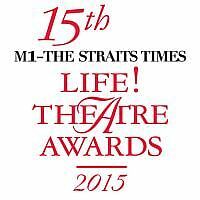 It is a three-way fight for the Best Set Design trophy at this year's M1-The Straits Times Life! Theatre Awards. The nominees are Eucien Chia for The Rise & Fall Of Little Voice; Wong Chee Wai for The House Of Bernarda Alba; and a team comprising Ho Tzu Nyen, Andy Lim and Jed Lim for Ten Thousand Tigers. The winner will be announced on April 20 at the 15th Life! Theatre Awards ceremony, an invite-only event which will be held at Esplanade Recital Studio. The awards are held in collaboration with Esplanade - Theatres on the Bay and are also part of The Studios: fifty season, featuring 50 Singapore plays, which runs from April 2 to May 10. Originally written by Spanish playwright Federico Garcia Lorca in 1936, The House Of Bernarda Alba was given a Singapore update by Wild Rice last year. The Spanish family of the original script became a Peranakan family in mourning. Set designer Wong took his cue from Peranakan houses in Malacca and Penang, with a deep layout and open courtyard. But he opted for a restrained approach to bring out the austere environment - a cavernous, predominantly black set with minimal props that allowed its all-female cast (including actress Claire Wong as grieving widow Bernarda Alba) to shine. Says Wong: "From the onset, we wanted to try and create a space where there is the pretence of being open and airy, but was actually closed and oppressive." The larger-than-life door at the back of the stage at the Drama Centre Theatre was a nod to Greek tragedy, where it is usually used for entrances and exits. In this production, the door acted as a reminder of the stark border between the inside and outside world. Wong explains that he had wanted to create the feeling of "being trapped once the main house door was closed" and using the windows to create a "false belief" that the women were safe in their house, "yet open to the gossip and peer pressure from the villagers". Life! theatre correspondent Corrie Tan called the set "gorgeous" in her review last March: "The Peranakan setting is hinted at, with the glint of a beaded slipper and those louvred shophouse windows, but never overtly explained, leaving just enough room for one to draw a parallel with rule- heavy Singapore." Mr Matthew Lyon, a Life! Theatre Awards judge and co-editor of online arts journal The Flying Inkpot, says: "I can't remember such a huge space feeling so claustrophobic... Chee Wai created an epic space to house the volcanic emotions of Lorca's text. He made Alba's house almost unfeasibly deep, right to the back wall of the theatre, and this facilitated some striking stage pictures." It may be a jungle out there, but for Ho's work Ten Thousand Tigers, the creative process was a lot more ordered and democratic. Its distinct cabinet of curiosities look - consisting of large dioramas filled with different striking images - came out of an informal survey. Each member of the team, down to the production manager, composer and actors, had to suggest an object relating to a word from the script, which would then be captured in the set design. The result? A richly textured visual journey - its manifestations include an eerie mass of appendages, giant wayang kulit cut-outs, an aquarium with water overflowing and a patch of lallang - that attempts to trace the narrative of the history and mythology surrounding the Malayan tiger. Life! theatre correspondent Corrie Tan praised the set design in her review in April last year. She wrote: "There is a deeply cinematic quality to Ten Thousand Tigers, with its careful use of light and shadow to frame images and objects... The visual reveals are surprising and, at certain moments, breathtaking." The collective admits in an e-mail interview that there were difficulties in realising the set. "We were dealing with shelves of heavy metal, with hydraulics, with the automation of fragile objects, multiple channels of synchronised sound and videos." Unsurprisingly, they acknowledge that the work was "an experience of excess". "There were things happening all of the time, at varying speeds and levels of visibility. No one, not even ourselves, would have been able to perceive everything." There was a lot of physical abuse going on behind the scenes of Pangdemonium's musical, The Rise & Fall Of Little Voice. But no need to raise any alarms. The battering was done to the retro furniture - set designer Chia's way of recreating the interiors of a shabby 1970s terrace house, which came complete with crooked wallpaper, broken tiles and a dying houseplant (belonging to Pangdemonium founders Adrian and Tracie Pang). And get this, there was even a scene where the house catches fire, albeit in an artistic fashion. Chia says: "We had to create a set of furniture that was completely burnt to cinders. These were ripped apart, painted black and had charred effects... Must have been cathartic for the crew." Besides portraying the decaying family home of its main character, Little Voice, his revolving set did double duty. Its flip side revealed a cabaret reminiscent of the ones that used to be in Bugis Street and Gay World in post-independence Singapore. To bring the audience into the action, he removed the conventional seating in the front of the Drama Centre Theatre and replaced it with cabaret tables for VIP ticketholders. Chia says: "This way, Little Voice could sing directly to the audience as her audience, drawing them into the performance and mingling with the 'patrons'." Mr Matthew Lyon, co-editor of online arts journal The Flying Inkpot and one of the Life! Theatre Awards judges, says: "Eucien managed to cram a lot into a small space. His multi-room, multi-level, multi-location set felt cramped when appropriate, but also spacious when needed, and the period detail was excellent, creating a powerful sense of time and place."